UNITED NATIONS, Jul 28 2017 (IPS) - The demographic dividend: though not a new concept, it is one of the major buzzwords at the UN this year. But what does it really mean? There are 1.8 billion young people between the ages of 10 and 24 around the world, the most in the history of humankind. In Africa alone, approximately 60 percent of its population is currently under 25 years old and this figure is only expected to rise. With this change in demographics comes more working-age individuals and thus the potential to advance economic growth and sustainable development, known as the demographic dividend. However, this will not happen on its own. Investments are required in areas such as education and sexual and reproductive healthcare in order to provide youth with opportunities to prosper, major components of the globally adopted 2030 Agenda for Sustainable Development. 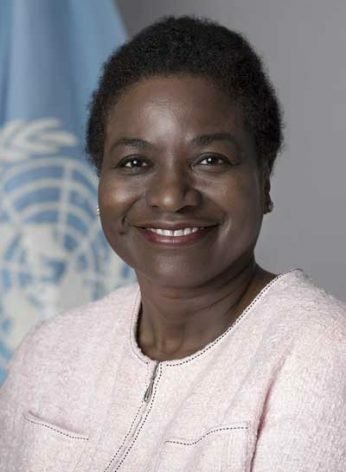 The UN Population Fund’s (UNFPA) new acting executive director Natalia Kanem, who assumed her new role after the unexpected death of former executive director Babatunde Osotimehin, sat down with IPS to discuss the issues, challenges, and goals towards achieving the demographic dividend and the Sustainable Development Goals (SDGs). Q: What is the demographic dividend and why is it so important? A: The demographic dividend is the economic boost that happens in a country when you have more people in productive working ages employed and contributing to the economy compared to the categories of young people or elderly who are dependents in economic terms. For many of the countries which dwell in poverty today, we are seeing this transition that was predicted to happen. Through the success in healthcare and sanitation, society has been able to increase life expectancy—people are getting older so we are getting lower death rates. At the same time, we are getting lower birth rates, which are happening in some of these countries, and that means the working-age population is going to have fewer mouths to feed, fewer shoes to put on the school-aged child’s feet. Many things have to also happen at the same time—it’s not just simply lowering the birth rate. You have to equip people to be able to be productive members of a society, and this means education is very important. Adolescent girls in particular should be equipped to reach their potential by providing education of certain types of skills or training. All of this is going to add up to much more societal progress, potential of young people fulfilled, and human rights being enjoyed. Q: Where does this fit in and how does it inform UNFPA’s work under your leadership? Does it signal a paradigm shift? A: We do feel that it is a paradigm shift, and what we are doing at UNFPA is making it accessible so that governments understand its relevance. The mandate of UNFPA is to promote universal access to sexual and reproductive health and reproductive rights, and we feel that a woman’s choice is at the center of all of this. Right now, as girls get married young and are having coerced sexual activity young, they are really not able to decide for themselves about how many children they want, when they want to have them, and how they would like to space them. By giving women the choice to exercise their reproductive wishes and educating them—all of these things are going to ignite the potential of young people. These people have potential, they want to work, they want to be educated, they want to contribute—so let’s make it easier for them, let’s not hide sexual and reproductive health information. Not every method is going to work for every person, so we really look at human rights across the spectrum of choice. We also have a lot of experts who have been very strategic in thinking through what really makes a difference, and we can say emphatically that investment in sexual and reproductive health way outweighs the costs—you at least double your money, and if you do the whole package, you can actually get 122 times the investment. There is nothing on the planet that gives you that kind of payback. Q: Why isn’t it enough to just equip youth with skills and jobs? A: The young person exists in a societal environment like we all do, and girls tend to get left out of that picture. In the past, when we were thinking of farmers, we didn’t realize that more than half of the farmers were women. So we were giving all of the agricultural resources to the wrong people. And here we are saying the adolescent girl is half of the world and she also needs to be deliberately included. The cards will be stacked against her if we don’t protect her so she doesn’t fall into the trap of sexual and reproductive dis-ease—so she’s pregnant before she wants to be, she is having her kids too close together, she is physically exhausted, and if she doesn’t finish her education, all of these things work together. So that’s why we keep harping on this balance of all of these different elements. The Republic of Korea is the classic example of how its gross domestic product (GDP) grew over 2,000 percent in the 50 odd years when they were investing in voluntary family planning coupled with educating the population and preparing them for the types of jobs that were going to be available. South Korea’s population pyramid went from looking like a triangle, where there wasn’t enough working age people to take care of those at the bottom, to where there were fewer children per family and greater ability to invest more into nutrition and education and all of the things families want for their children. And it’s not just fewer families alone, because if you have fewer families but she doesn’t have an education, then it won’t work. You need the packaged deal. We are ultimately talking about a social revolution which sees young people as an asset to their family, community, and country. Q: How accepted is the correlation between growth and issues that may not be so obvious such as sexual and reproductive health or child marriage? Has there been pushback on that? A: First of all, there was lack of recognition. It seems like the dots are very far apart until you paint the picture, but we have been explaining that better. The regional report card atlas which we just launched earlier this month for the African Union Summit is very telling. We looked at those same parameters for every single African country, one of which was early marriage, and it varies so much. In some countries, it can be up to 70 percent of girls getting married before the age of 17. In Rwanda it’s under 10 percent, and they have very good family planning which they’ve been working on for a while. Uganda is a very good example of how pushback was transformed. President Museveni came in as a strong proponent of big families and said that they need a big population in order to have more workers. But after a lot of discussion, he saw that Uganda already has a big population but it wasn’t enough. So later, the President started advocating strongly for voluntary family planning services and services like midwives because again, the woman has to be sure that when she does get pregnant she and her baby are going to survive. Uganda has now transformed its economy and is starting to see that demographic dividend boost. Q: Where do the resources come from for countries to invest in youth? A: Many countries are looking to invest their own resources in this proposition because the return on investment argument is highly persuasive. We have also garnered the interest of development banks. The World Bank is working very closely with UNFPA on the Sahelian Women’s Economic Development and Demographic Dividend (SWEDD) program. It’s only been active for a little while now but it is wildly successful because it looks at rural women in countries of the Sahel. There is also a huge role for the private sector. Government is very important because of policies and setting the tone and norms and laying down the expectations. But the reality is that the private sector employs 90 percent of people in the developing world. This coupling of the public government side and the private investment side is very crucial to ensure rights, freedoms, services, and accurate information—all of that together is needed for development and for this bonus that we call the demographic dividend. Q: How are the recent funding cuts by the United States affecting UNFPA’s work? Is it hindering progress on the demographic dividend and/or the sustainable development goals? A: First of all, I would like to say that UNFPA is moving forward. We are steadfastly committed to our three goals: Zero preventable maternal deaths, zero unmet need for family planning, and the elimination of harmful practices including violence that affect women and girls. We are very focused on these three goals in our work with governments, civil society, private sector, and other actors in over 150 countries to honor the legacy of our late boss as well as those who preceded him. There are still 214 million women who want family planning and don’t have modern contraception. We have a funding gap that stands at about 700 million dollars from now to 2020, and we have been looking for additional funding because we need to reach more and more women and girls without cutting the programs we already have. The United States’ defunding was such a disappointment in terms of our good standing in the world and our regret that the decision was based on an erroneous claim. Ultimately, I think our regret on the decision is certainly monetary because we were using that money very effectively in humanitarian core operations. But we also regret it because of the stature of the U.S. in the fight to make sure that there is gender equality as well as reproductive health and rights. We are really looking forward to continuing a dialogue and hopefully keeping an open door because the U.S. and U.S. Agency for International Development (USAID) have been very good partners with UNFPA. The time is now for young women to be protected from it being their fault that they got raped, for them feeling shame when they have been assaulted. Let’s turn that around so that men and boys, women and girls live peacefully with the resources they want and need to survive and thrive. No one of us can do it alone and I think that UNFPA is a good partner, and that we deserve to be supported. *Interview edited for length and clarity.